The silverware has headed overseas every season since the prolific Noel Fox triumphed at the famous Bull Island venue in 2003 with the sublimely talented Rory McIlroy forced to settle for second best after a play-off with Finland’s Antti Ahokas at Portmarnock four years ago. 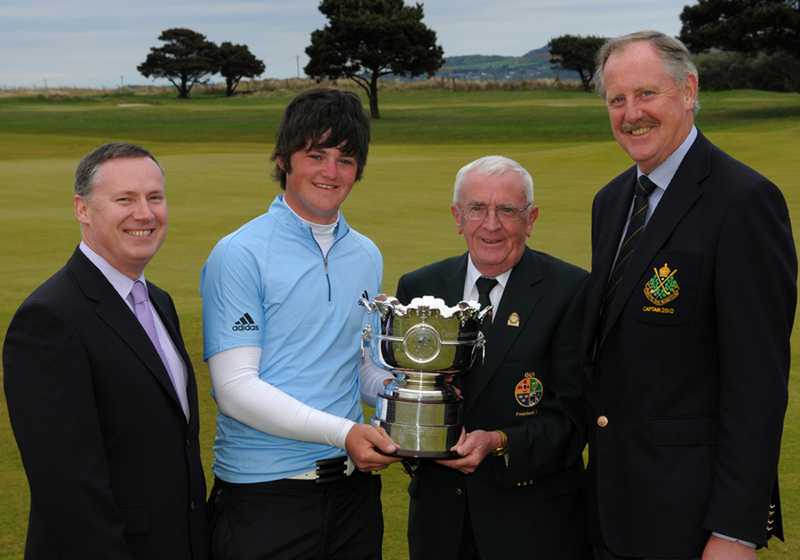 It would be unfair to expect Dunbar to follow in McIlroy’s giant sized footsteps, but the 20 year old has proved that he is very much a product of the Ulster nursery that gave us talents such as Garth McGimpsey, Graeme McDowell, Michael Hoey, Darren Clarke, David Feherty or Ronan Rafferty in recent years. For a while it looked as if Dunbar would be taken to sudden death but when 25 year old Nicol got a bad bounce off the downslope of a greenside bunker and bogeyed the last, the Rathmore man was only asked to produce a par-four at the tough 18th to take the title. He passed the test with ease, cracking a hybrid down the left hand side and following it with a fading, 206-yard five-iron that stopped 25 feet beyond the stick. 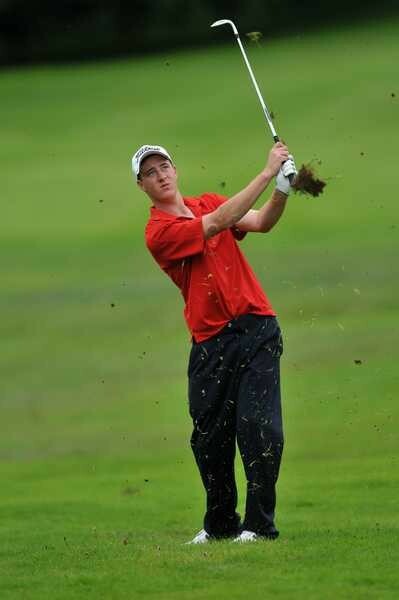 After two putting with ease for a level par 72 and one-stroke win on four-over par 292, Dunbar hugged his Ulster playing partners Luke Lennox and Connor Doran and started making plans to tee it up for GB&I in the St Andrews Trophy match with the COntinent at the end of August. Dunbar’s success did not come as a surprise, following his breakthrough win in the prestigious St Andrews Links Trophy at the ‘Home of Golf’ last season. Not only is the fresh-faced 20-year old a racing certainty to play on the 10-man Great Britain and Ireland side against Continental Europe for the St Andrews Trophy in Italy at the end of August, he will also contend strongly for a place on the Walker Cup side that will clash with the USA at Royal Aberdeen next year. “I don’t know if this win is more special or not,” he said with a grin. “The St Andrews Links is a pretty big one but another one means more when you win again, it’s great, it still hasn’t sunk in. Moyola Park’s Luke Lennox will also be hoping to make those representative sides but knows that he must tighten up his long game in particular when he takes on rounded players of Dunbar’s calibre. Leading by two strokes from Doran on two-over par entering yesterday’s final 36 holes, Lennox soared to three over after five when he drove OB at the fifth and ran up a triple bogey seven. But he stormed back to lead by two shots on two over par from Dunbar by following an eagle three at the 11th with birdies at the 14th, 15th and 16th. He didn’t last the pace, however, and closed with a 79 as the final round quickly developed into a head to head between Dunbar and Nicol. The Irish star bogeyed the first but after birdies at the second and fourth, he made par after par to open up a three stroke lead on three-over par with five to play. Playing in the match immediately ahead of Dunbar’s, Nicol reduced his rival’s lead to just one stroke when eagled the par-five 14th from 20 feet. Dunbar wobbled for a while–missing a 12 foot birdie chance at the 15th before being forced to hole a tricky seven footer for par at the 16th after bunker trouble. He eventually bogeyed the 17th, pulling his approach badly and chipping weakly, to fall back into a tie for the lead with Nicol on four over par. But just as he was stepping onto the 18th tee, he heard that the Scot had bogeyed the last for a 71 that set the target at five over 293. Dunbar only needed a par four to win and while his tee shot with a hybrid flirted with the traps on the left, he produced the approach shot of a champion to clinch his second major victory. South Africa’s Louis Oosthuizen shot a four under par final round of 68 to win the AIB Irish Amateur Open by a shot at Royal Dublin.